The Nkuringo Gorilla Camp is located at 2161m above sea level on the Nteko ridge, overlooking a beautiful swath of the world-renowned Bwindi Impenetrable National Park. 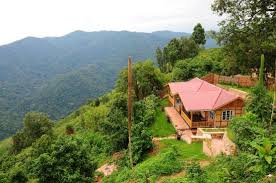 The ridge provides a superb vantage across the Kashasha river valley to the breathtaking, conical peaks of the Virunga Volcanoes, and the surrounding canopy of the Bwindi Forest, home to the endangered mountain gorilla. Our accommodation includes en-suite cottages, bandas, rooms, tents and a campsite for those who travel with their own tents. We also have a small restaurant serving locally sourced food, and self-catering facilities, so we can welcome guests of all budgets and tastes.